And the winner is … drum roll, please! The 2017 winner of Suburban Chicago’s Got Talent competition? 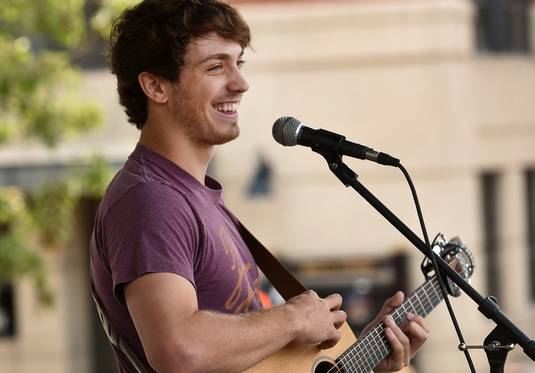 It’s West Dundee singer-songwriter Garrett Ryan, who wooed the crowd at the Taste of Arlington on Aug. 5 with a love song to his girlfriend. Of course, he wasn’t the only one to impress the judges and the audience gathered in downtown Arlington Heights. His nine competitors did an amazing job, as well. This was no shoe-in! Another singer-songwriter, Kayla Seeber of Poplar Grove, was announced this year’s fan favorite. If you want to check out Garrett’s music, he was featured on ABC 7 the day after his big win. Check it out here.